← A is for Apiphobia. 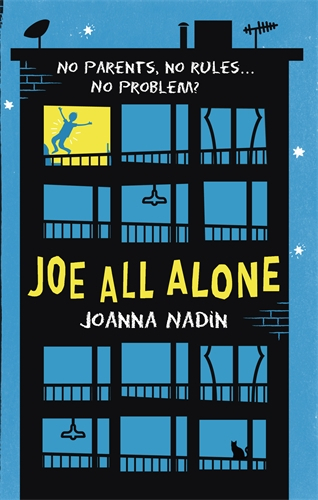 Joe All Alone is a book about friendship. It’s a book about family, and what constitutes that today. It’s a book about bullying. It’s a book about difference and acceptance. But beneath all that, it’s a book about one of the most fundamental needs in life: money. I know heat, food, water come first as basic bodily requirements. But they don’t come cheap. And they certainly don’t come free. So the premise is this: Imagine your mum tells you she’s going away on holiday with her boyfriend. And imagine she says you’re not going; you’re staying home alone. Exciting, huh? Because you’ve seen it done before: Macauley Culkin fending for himself in his suburban mansion, then in a swanky New York hotel. The thing about the Home Alone films though is that not once does Kevin have to seriously worry about what to do when the dollars dry up; he’s minted, and besides, his mom and dad’ll be home any day to bail him out. Joe Holt’s house, and bank balance are a different ball game. He lives in a rundown flat in inner London, he has no money of his own, and his Mum leaves him just £20 to get through the week. Does that seem a lot? You could definitely do a decent food shop with a twenty. But add the electric meter onto that. Add the money some kid at school’s demanding off you. Then add the fact that your mum might not show up back on the doorstep when she’s supposed to. You do the maths, as they say. There are 3.7 million children living “below the breadline” in the UK today. To give you a better idea, that’s 9 kids in every class of 30, and in Peckham, where Joe lives, it’s 12 in every class. The truth is, most kids aren’t Kevin McCallister, not even close. And too many are in families struggling to put food on the table, to turn the heating on, to buy second-hand shoes, let alone new ones. And it’s a growing problem. Thanks to welfare cuts under this government, another 700,000 kids will be in poverty by 2020. And if you don’t believe the numbers, you only have to look at the rise of food bank drop-offs at supermarkets, or in the number of our friends who rely on them, to see for yourselves how big an issue it is. Yet it’s not something we read much about in books, or see up on the big screen. Glamour sells, as a rule. Plus it’s not easy speaking out, let alone writing a novel or a film, when you’re struggling to pay bills. Joe All Alone, and the follow-up White Lies, Black Dare (out in 2016), try to give those 12 in 30 kids a voice. And if you want to know more, or help make a difference, click on these links. This entry was posted in Blog, Reading, Teen and tagged child poverty, CPAG, Huckleberry Finn, Joanna Nadin, Joe All Alone, middle grade, UKMG. Bookmark the permalink.